Jennie Higgin's and Deann Wilmer, both of Superior Montana, met in the summer of 2002 and began singing together, with Jennie playing rhythm guitar, and the both of them singing and harmonizing. In March of 2003 they called Rick Kellberg and had him play lead guitar for them. He also added to the harmony section, and added male lead vocals to their songlist. It was like magic! Things began to come together, and with the addition of musician Dan Hollenback's bass guitar playing and singing, they had a unique variety band. They then discovered Mark Feasel, also of Superior. He plays drums, and has given the perfect flavor the band has been looking for. In 2004 they heard a little gal from a neighbor town by the name of Denise Ishler belting out some mean blues and knew the stage was set for the band to be sporting some of the hottest vocals aroung punching out a wide range of venues for all to enjoy. "Under the Boardwalk," "California Dreaming," "Honky Tonk Woman," "Satisfaction,"
"Johnny B. Goode," "Redneck Woman" and the list goes on. 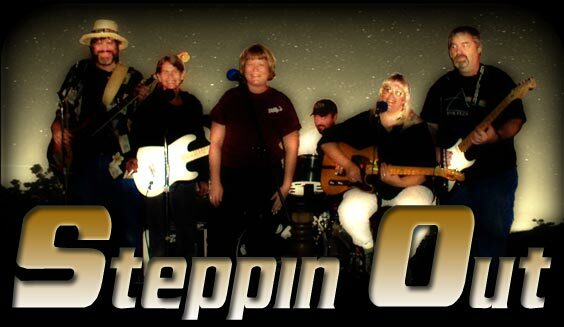 Steppin' Out is certainly a pleasure to listen to, with a variety to entertain and energize most all music lovers.